Fortunate Phaka is creating awareness of the role the amphibians play in the natural world with a book published in isiZulu and English. If they aren’t being chased with a broom out the house, frogs mostly go unnoticed. But not to Fortunate Phaka. The passionate author and conservationist is creating awareness of the role the amphibians play in the natural world with a book published in isiZulu and English. The croaky critters are an integral part of KwaZulu-Natal’s lush landscape, and are important to the people that live there. His handbook, the first science journal in isiZulu, emphasises the existing relationships between local communities and the environment. “I learned from frogs that we are all connected,” Phaka says. Following from his Master’s degree in Environmental Science, the book details Phaka’s studies on amphibians and their habitat. In his research, the author also unearthed a fresh understanding of local expertise. “We have our own classification system that’s also similar to how science names and classifies things,” Phaka says. By adding an academic perspective to the existing knowledge, Phaka is showing others that African culture and the environment are inseparable. 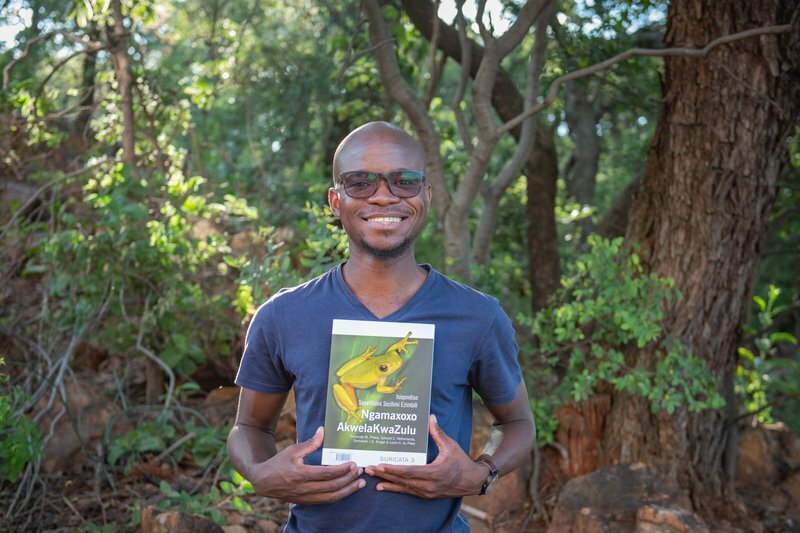 His field guide, titled Isiqondiso Sasefilidini Sezilimi Ezimbili Ngamaxoxo AkwelaKwazulu, or A Bilingual Field Guide to The Frogs of Zululand, was published in 2017. As Phaka’s love for the natural world grows, so does the demand for the publication. “I have received orders from seven of the nine provinces already,” he says. For his work, Phaka was listed as one of the Mail & Guardian’s Top 200 Young South Africans in 2016, and named as the Amphibian Conservation Research Symposium’s Future Conservation Leader for 2017. By creating a handbook accessible in both English and isiZulu, Phaka is aiding the understanding of both people and amphibians alike.